A friend of a friend told me about this babysitter tale that happened somewhere in Florida a few years back. Apparently, this 16 year old girl, Lucy (my friend couldn't remember her last name), went babysitting on a Friday night and something weird happened. So Lucy was babysitting these two little boys while their parents were out, and the parents were expected to be out 'til quite late. This gave Lucy a number of hours of babysitting, from supper time 'til around midnight. Lucy fed the boys supper and let them play after eating while she cleaned up the dishes. Lucy put the boys to bed upstairs, each in their own separate bedrooms. She went into one boy's room, read a story and tucked him in, and then to the other boy's room to do the same. Then, once the boys were nicely tucked in and almost asleep, Lucy went back downstairs to watch TV and wait out the time 'til the boys' parents would arrive home. While Lucy was watching television, a news report came on and a news lady gave a warning that a mental patient had just escaped from a facility and that local authorities were busy trying to find and apprehend the individual. Knowing the house was in a decent area of town, Lucy didn't feel too worried but did get up to double check the lock on the front door. It was all locked up but she was glad she double-checked, anyway. She flipped the channel on the tv to get rid of the news report and found a movie to watch 'til the parents could return home. He became afraid, so he quickly padded across the hallway into his older brother's room. When the older brother awakened he told the younger one the noise was probably coming from Lucy watching a movie. He said his younger brother could sleep with him if he was scared, so together their heads hit the pillow and they started to fall asleep. But then the noise stopped. The boys hopped back into bed and lay quietly, just listening, and were unable to fall back asleep. They waited that way together until their parents got home. When the parents returned, they were taken aback by an entirely macabre and gruesome sight! Lucy was found at the end of the trail of blood and almost to the top of the stairs. Her arms had been cut to stumps just above the elbows and it appeared she had been using these stumps to try and navigate the stairs. Multiple stab wounds marred her young body all over and the babysitter bled out, on the stairs, while trying to get upstairs to protect the boys in her care. Nobody was ever able to figure out who did this to Lucy. Nobody ever found the escaped mental patient, either. I don't know if you watch the you tube channels "Angry Grandpa" and "Kid With a Camera," and I just found them yesterday. The individuals who manage those channels/IDs make videos all the time, as I found out through browsing their channels... This zombie prank is one of the best I've seen. I found this young guy who pranked a family member into thinking a zombie apocalypse was suddenly happening. Man, the older guy (Angry Grandpa) gets really scared! Then, after he's told of the prank, he gets really ANGRY! Are you prepared to be pranked? Hey happy TWD day! It's not Sunday anymore - it's The Walking Dead day! I'm working on returning to blogging more and Sundays are a great day for me to post as I'm usually at home and don't plan much extracurricular activity on Sundays beyond chores. As an added bonus, Sundays are also when The Walking Dead puts out a new show in the evening. Yay! As a true fan of all things TWD, I also spend time checking out some social media before the show, video clips - heck, sometimes even the last week's full episode just prior to watching the newest instalment. For me, it's not Sunday, anymore - it's TWD day - and I think that, for you, as well, there should be NO MORE SUNDAYS (well not past mid-afternoon 'cos a lot of people go to church and THAT is still important)! I hereby declare that the day of the week before Monday is now to be known as TWD DAY! K, so when I typed in a google search, "how many people watch the walking dead on sunday" the search completed in 0.39 seconds with "about 116, 000 results." The top 5 sites returned were deadline dot com x 2, wetpaint dot com, screenrant (oh I am definitely going there! ), and tvguide (might go there, too - but later). I went to the first search result - HUGELY DISAPPOINTED because it's an OLD article from October 14, 2013, saying that the Season 4 debut show had a record-busting sixteen point one MILLION viewers. Now I want to know - how many people might not have TVs? Poverty is a calamity in our world with people not able to watch TWD... everyone with a TV should invite everyone without such technology - over for Sunday late supper and TWD viewing! Break bread together, learn how to survive the zombie apocalypse! This post has been fun. It's time for me to go check TWD Twitter, FB and other social media to check out what's being said, posted, etc. As an avid viewer and fan of The Walking Dead, I was bound to get onto the topic of Carl Grimes, and the fact that so many people just want Carl to stay in the house, stay back, get back, keep the door locked, etc. There is plenty of criticism online from bloggers, article writers, people interviewed for news and entertainment bytes - all about The Walking Dead character, Carl Grimes and his penchant for getting into sticky, dangerous situations because he wanders off or won't stay in the house. I've read blog posts where the writers call even the writers/creative team, producers and directors of TWD show awful names because the latter should never have written/presented Carl's character that way. By contrast, I have loved what writers/creators of the show have done with the Carl Grimes character. As I watched and proceeded through all of the episodes, from season one to the last season, I kept thinking, "Yeah, a kid would do that - wander off, explore." (Let us not forget that Carl showed up a time or two when and where he wasn't supposed to be and saved other characters). At times, particularly early on in the series, Carl hasn't quite understood his strengths and weaknesses, primarily assuming that he can handle much more than he actually can. How natural is this in a kid? I think all kids go through stages of overestimating their skills, underestimating risk and danger. I'm glad the people who create and produce TWD have allowed Carl to have so many flaws, make so many mistakes, tick off so many adults and even viewers. This has all made his character changes really stand out. Carl could have been pushed to the sidelines much more in this show, one of the most violent shows on television. Carl could have been another cardboard kid character, just present as a character accessory to Rick Grimes, to prove that Rick was once a family man before the Zombie Apocalypse hit. Instead, Carl has become an integral and really important member of the survivor group he's in, including resorting to violence when that is needed - even from someone who is still technically a KID. Okay, so Carl isn't a GREAT KID, not a perfect kid - he wasn't in the beginning of the series, either. Not being perfect made him seem so real, quite normal, as far as children go. (Children make MISTAKES all the time in real life). As the series has progressed, Carl has re-formed with a few holes, gaps and breaks in his general make-up, but then, this has happened with everyone/character in the show. Did you think this show was going to be Little House on the Walking Dead Prarie? To sum up, I think we're seeing, in Season 4 and 5, a Carl who has learned some hard lessons, partly from previous mistakes of his own, and he's grown into a kickarse character that more viewers respect. By Seasons 4 and 5, Carl can take care of himself in about as many situations as the adults can. It's New Years Eve day 2014 and the new TWD shows won't start up again for several weeks, so I'll be off now to watch TWD past episodes and take another look at Carl, who won't stay back, won't stay in the house, keep the door locked, and who now kicks zombie arse! Earlier today I uploaded my own work on the Scribd site - an article on research tools for The Brothers Grimm tales at the University of Pittsburgh's "Grimm Brothers' Home Page." It's not a pretty portion of the University of Pittsburgh website, but I think if you're interested in good content and scholarly work, you'll get a lot out of the Grimm Brothers' Home Page. While there are some dead links among the many awesome resource links found on this page, the articles connected with these dead links might simply be in the process of being updated. I've known of and used this section of the U of Pitt's website for quite a long time (a few years) and in the past, I know I've accessed and read articles from pages/links that didn't work when I visited just today to compose searches and write a review article on this content. I've decided to post this information to my blog because, although folklore, fairy tale and fable hunters and readers might already have heard that Grimm's material is on the U of Pittsburgh's website, the information isn't that easy to find when you just hit the main University site page! In fact, I was going to include a link navigation pathway tutorial in my article but I clicked around with ZERO success for several minutes, so I thought the tutorial might take longer to write than a review article! (haha). 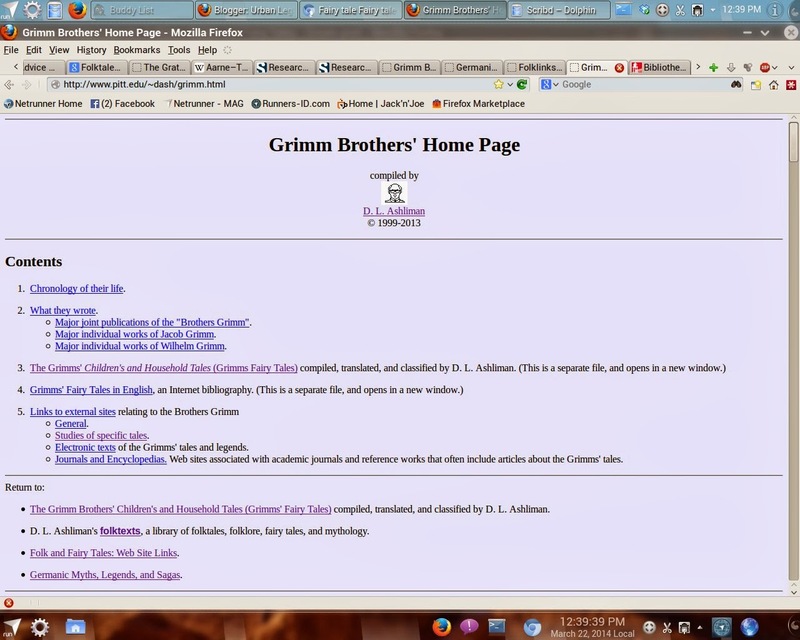 Since this is basically a review of the Grimm Brothers' Home Page - not the "info-article" on resources for researching Grimm tales (which is more what the Scribd article is about), I'll say again in a slightly different way, don't be turned off or turn away from the looks of the Grimm Brothers' Home Page. It's a little index of gold on Grimm topics and information. It just happens to look, well... really junky, sorry to say. In fact, I really hate the appearance of the page, myself, but I return to that section of the U of Pittsburgh's site ALL THE TIME, approximately 10 times per month for the last few years! A great many Google searches on "Grimm" scholarly topics will lead you to the same section I'm reviewing, which is how I have managed to navigate to find the gems of Grimm info, myself. I bookmarked the page long ago and suggest that you do the same. I'm sure this section of the U of Pitt's site looks this way because not much time has been put into making a flashy page - while most of the time has been dedicated to providing sound information, links, and content on this page. 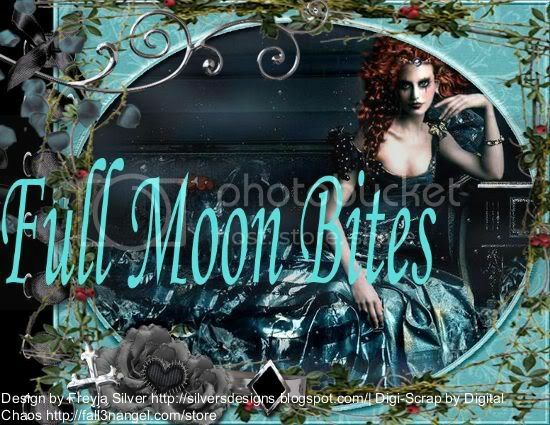 That's the main thing, in my opinion, as when I want to find out what tale type a certain Grimm tale is, I want to be able to find, in rather plain language, the information I'm looking for on the U of Pitt pages. If you want to make your visit more interesting, I don't know if you can in a visual sense, but you can try whistling the Close Encounters of the Third Kind theme while you browse if that helps. That's what I do ! As far as attractiveness goes, the page is a low 3 or 4 out of 10, in my opinion, but for content, I'll rate this section of the university website a solid 9 out of 10 (some links don't work). I re-tell stories, legends, fairytales and such but am not the original creator or author of such tales - the general public tells the tales - I just provide commentary and interpretations.